After a brief hiatus we returned to the topic of Christianity; this was the final of five field trips exclusively themed around Christian sites (although we are sure to visit more as the course continues) with a specific emphasis on how to guide these places for pilgrim visitors. As avid readers of this blog will no doubt recall, we spent two days in the north of the country in the area around Nazareth and then around the Sea of Galilee; then followed two trips in Jerusalem, the first around the Mount of Olives and Mount Zion, the second along the Via Dolorosa. This final trip included various sites of Christian interest in the surroundings of Jerusalem, namely Abu Ghosh, Ein Kerem and Beit Jamal. 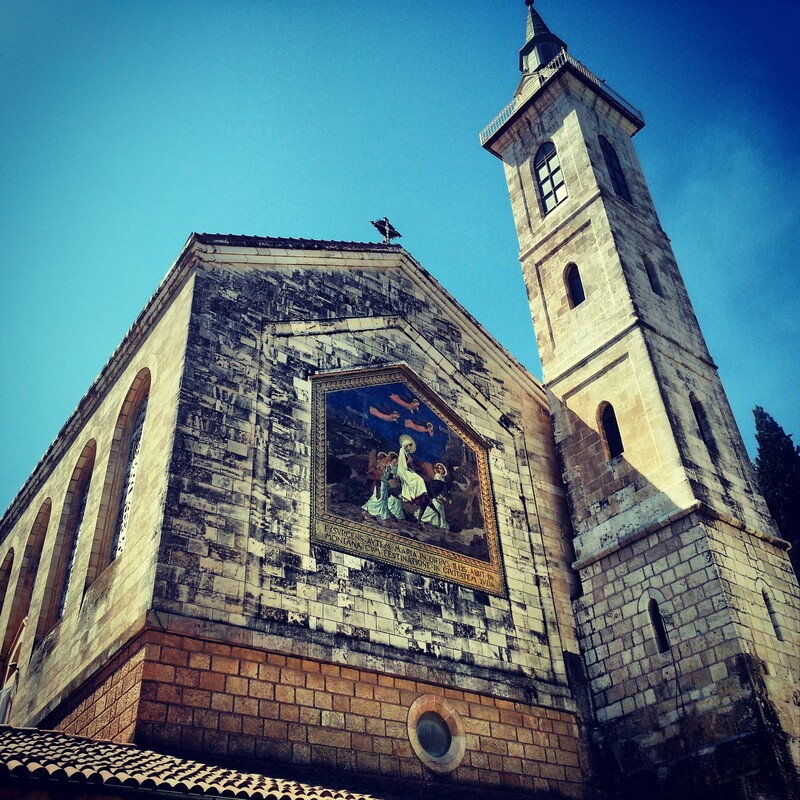 We began our day at the Benedictine Monastery in Abu Ghosh. At first we met with a rather fantastic monk, called Olivier. 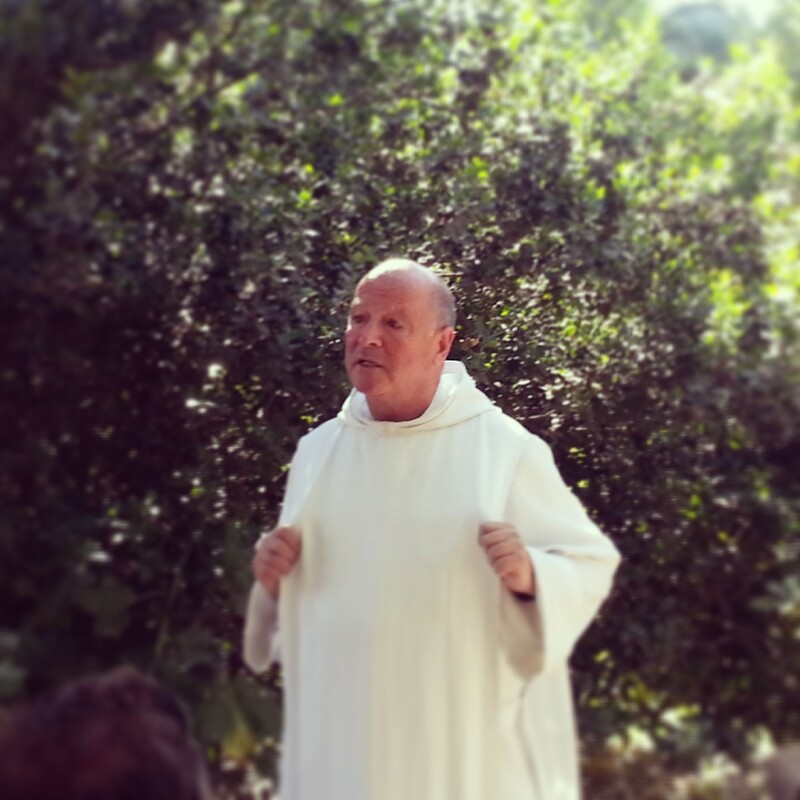 He is French but speaks fluent Hebrew and gave us a brilliantly entertaining and informative talk about life as a monk and the Benedictine tradition. He peppered his speech with Hebrew slang and many jokes. It seems he is quite a character; also a huge promoter of coexistence and is proud of his monastery in the midst of an Arab village, next to a mosque, where everyone gets on. He also has close relations with Jews in the area and proudly sang to us the opening verse of the Jewish hymn Adon Olam inside the church! Speaking of the church, it is one of three examples of a complete Crusader church in Israel – the others were all destroyed at various points. Again, avid readers might recall that the other examples of this are St. Anne’s Church in Jerusalem and the Great Mosque of Ramla. It was fascinating to be inside and also note the original frescos which have recently been made visible via careful restoration. 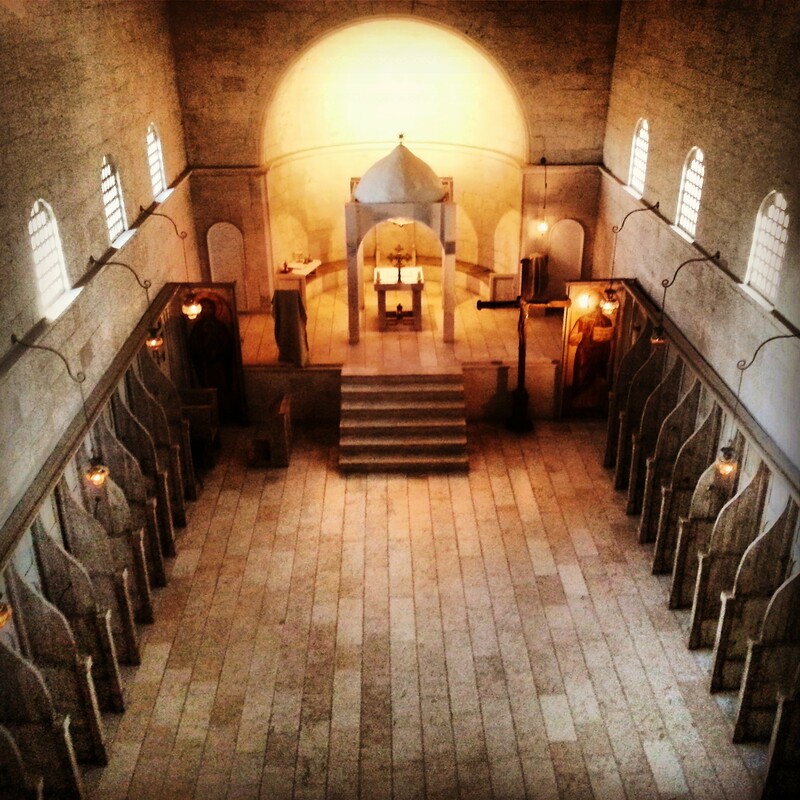 The crusaders believed this site marked Emmaus, where Jesus appeared following his resurrection. We left Abu Ghosh and travelled to the picturesque town of Ein Kerem in the suburbs of Jerusalem. 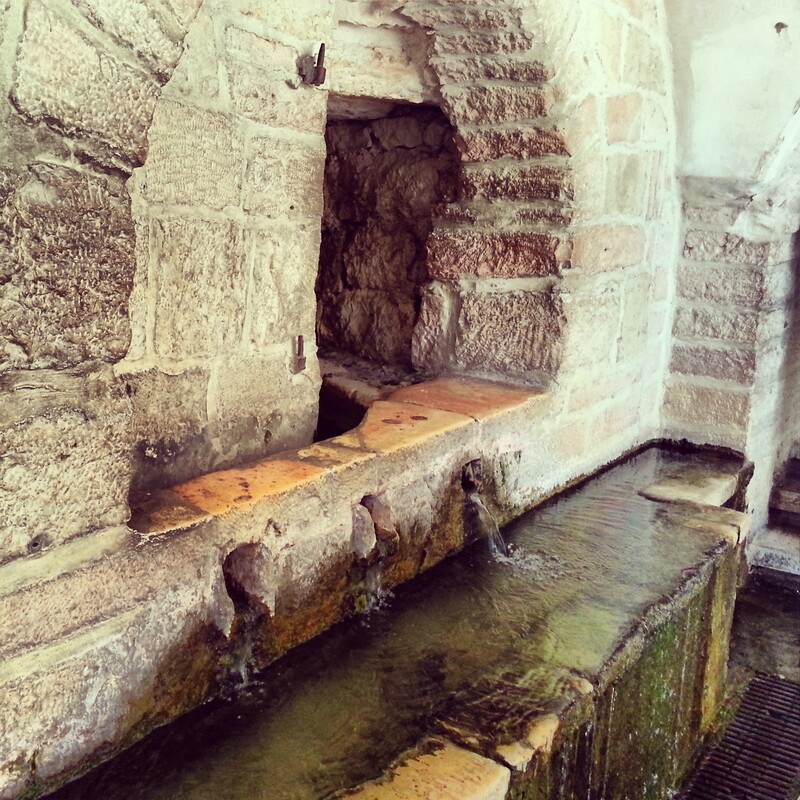 This site is believed to have been the home of St Zachary and St Elizabeth, the parents of John the Baptist. It is therefore important for two reasons: John the Baptist is an important figure so his birthplace is significant; furthermore Mary visited Elizabeth during her pregnancy. This event is marked at the Church of the Visitation which is reached via a relatively steep climb up the hill. As this is high up the hill it is considered the summer house of Zachary, and therefore based on the timings of the visit, it is considered that they would have met here. We returned down the hill, pausing briefly at Mary’s Spring, where she would have stopped to drink on the way to visit Elizabeth. We also learned a little here about the history of the town which until relatively recently was a very small village far from the Jerusalem city limits. They have also found remains of homes going back to the Second Temple period, which is helpful for supporting the belief that John was born here. In the middle of the town is the Church of St John the Baptist, considered to be his birthplace and the regular home of the family. In the crypt is a cave which is considered to have been their home, and the church itself is decorated with beautiful Spanish tiles; its refurbishment (it was originally constructed in the Crusader period) was funded by the Spanish royal family. 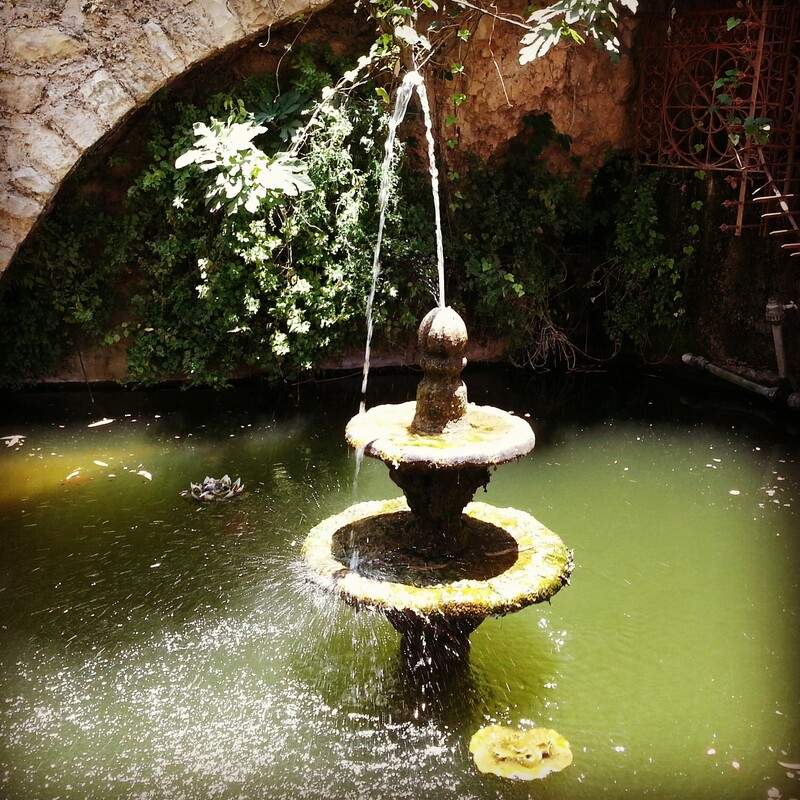 Leaving the quaint confines of Ein Kerem, we stopped off in the nearby moshav of Even Sapir. He is the Church of St John in the Desert, marking the location described in Luke 1:80: “And the child grew and became strong in spirit; and he lived in the wilderness until he appeared publicly to Israel.” The Hebrew word midbar is often translated as ‘desert’ but really means ‘wilderness’; therefore despite the green airy location of the site it can still make sense; and clearly in ancient times it was relatively deserted although still not too far off from the birth place of John in Ein Kerem. In the recently refurbished church there are beautiful murals; interestingly some of them contain Hebrew words and phrases as an example of Christians connecting with the original language of the Holy Scriptures. 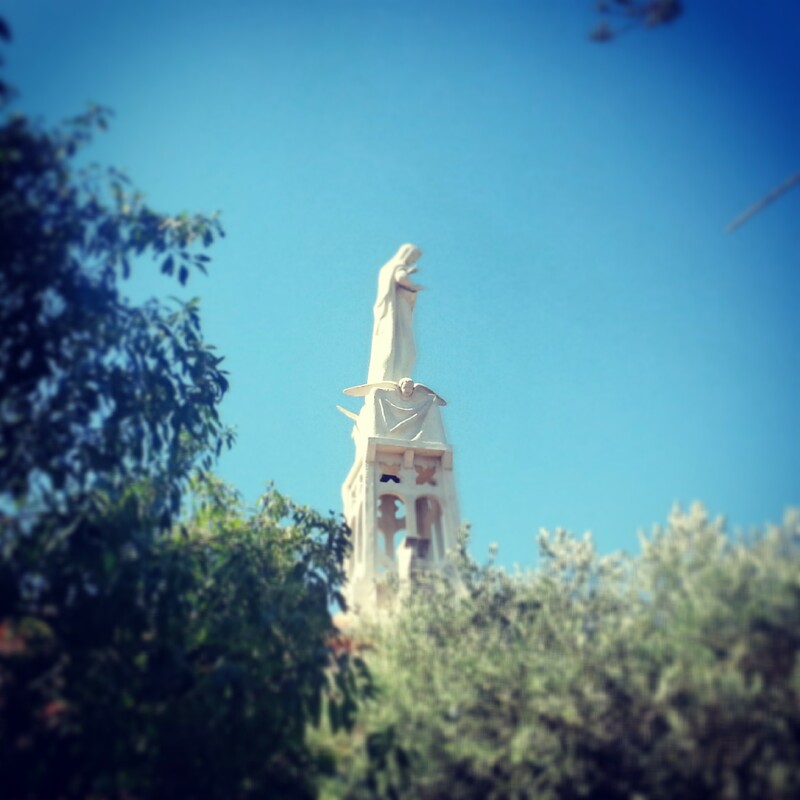 We returned to Abu Ghosh, where following an excellent hummus lunch (Abu Ghosh is well known for its hummus), we moved up the hill to visit the Church of Our Lady the Ark of the Covenant in Kirat Yearim (Kirath Jearim). This site is identified with the biblical settlement of the same name, which is of great importance as it was a resting place for the Ark of the Covenant for either 20 or 50 years, depending on the reading of the scripture. 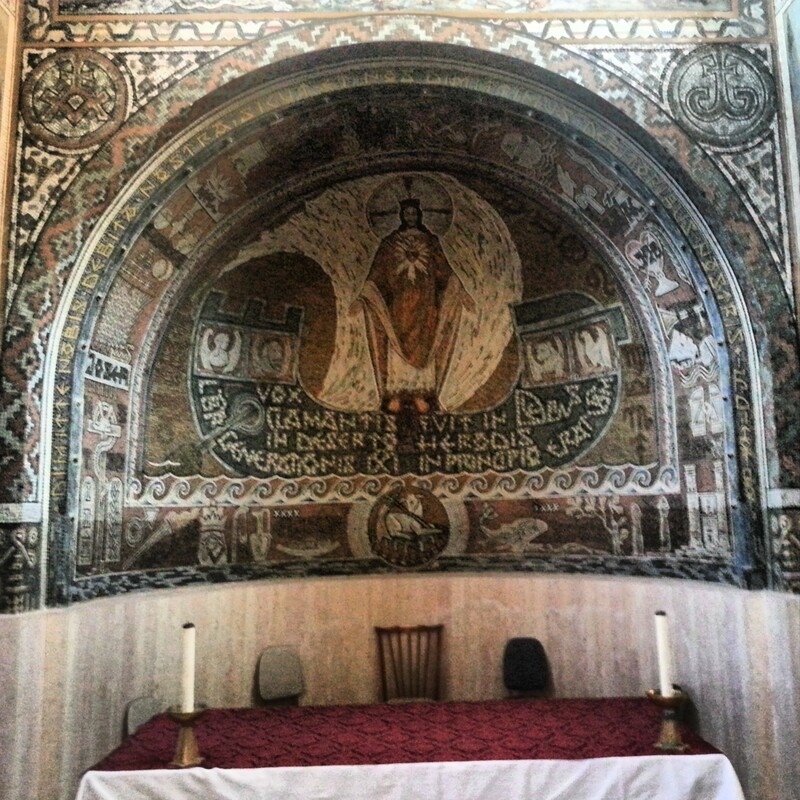 The church is modest but beautiful and it is possible to enjoy the original 5th century mosaics from the Byzantine structure on the same site, as well as the view over the surround hills. From Kiriat Yearim we continued southwest to Beit Jamal. Here, on the grounds of a Salesian Monastery, we first visited a convent of the Sisters of Bethlehem. The nuns here live in relative isolation in their own individual rooms during the day and even have individually partitioned areas in the church for them to pray. 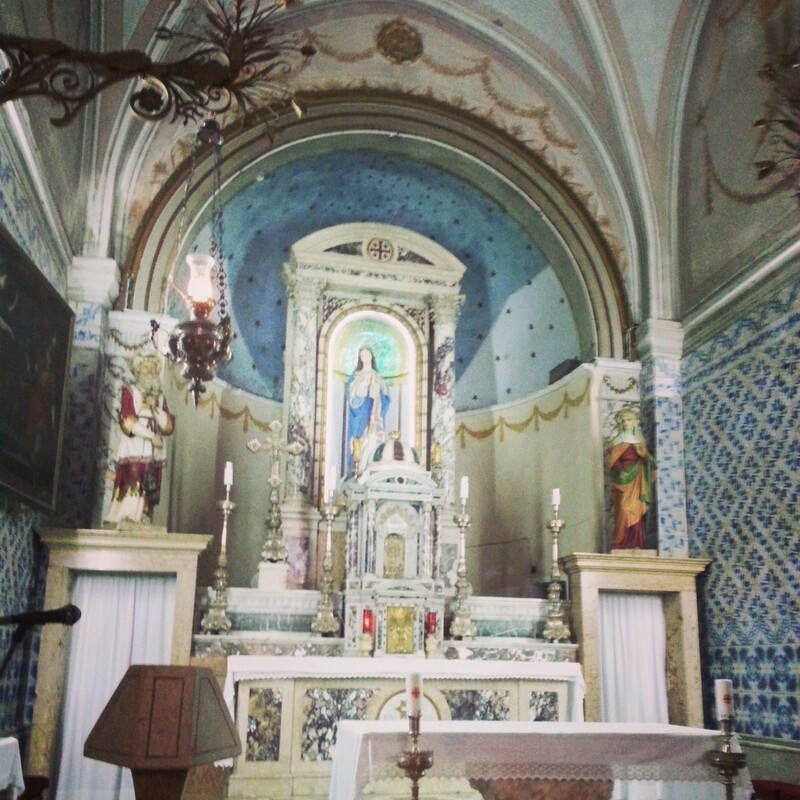 We learned about their lifestyle and enjoyed the view into the church. From there we walked over to the monastery of the Salesian monks and entered into the Church of St Stephen. The site is identified with Kfar Gamla, which was considered to be the home of the great Torah sage Rabban Gamaliel the Elder. He is identified as the Gamaliel who speaks on behalf of St Stephen during his judgement as detailed in the Book of Acts. Tradition then holds that following Stephens martyrdom (Stephen was the first Christian martyr) he took him to be buried in his home. This site, home to remains of a 5th century church, is considered to be that burial site, although it is known that the bones of St Stephen were later found and removed, first to Jerusalem and later to Rome. The modern church is quite beautiful and has an interesting fresco style which is designed to appear as if it is a mosaic. We exited the church and enjoyed the last rays of light over the Judean Lowlands before heading home. I have really enjoyed these Christianity themed trips; the background to all the sites is fascinating and the churches are beautiful. I look forward to one day guiding them myself!